Lighting is an enormously important factor in any portrait. A change in lighting can fundamentally alter the atmosphere of an image and so it is vital that you get this factor correct for each image that you take. Lighting portraits is a particularly interesting field, and one in which virtually every photographer has a different idea of the best methods. 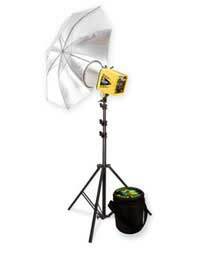 In many circumstances, the way you light a portrait will depend on the equipment you have at your disposal. Studio lighting is covered in a section elsewhere on this site, so this article will cover some of the best ways of lighting shots of people without special kit. To begin with, your decisions will depend on whether you are taking the photograph indoors or outdoors. In many cases this will in itself depend on the weather. In general it is thought that good outside light can give a more natural exposure than any artificial light sources; equally, however, an overcast day can make getting a good shot virtually impossible. As a result, it is generally recommended that you should only attempt outdoor portraiture on a sunny day. If you are going to shoot outside, your main concerns will be with shutter speed and aperture. If you have an option on your camera to alter the ISO then you should keep this as low as possible; this will give you a better quality image and will allow you to make use of effects such as blurring the background by creating a narrow depth of field. In bright sunlight you may wish to use a lens hood; this helps prevent lens flare and stray beams. You should also consider the background against which you are shooting your subject; very reflective surfaces such as white walls will produce too much light, possibly leading to over-exposure. Instead, you may wish to place your subject in front of a less reflective surface such as some trees. This can also ensure that, through lighting, your subject is the definite focal point of the image. Shooting portraits indoors can present its own problems and opportunities. It is generally accepted that, unless you are using dedicated photographic lights, natural light is superior to household artificial sources such as regular light bulbs. As a result, it is normally desirable to position your subject near a window in order to use as much natural light as possible. When shooting indoors you may need to use the ISO settings on your camera slightly more judiciously; increasing the sensitivity of your camera to light will enable you to make more artistic use of shutter speed and aperture without under-exposing so easily. When you are inside it is also possible to experiment with a variety of light sources. Artists such as Atget concentrated as much on the absence of light as they did on its use; you can create some very interesting effects, for example, with candlelight. Due to their colour temperature, candles produce a dramatic red cast. Similarly, you might try using interesting elements like window blinds to create other artistic effects. As with studio lighting, the key here is experimentation: there is no right or wrong answer, so let your imagination run wild!